This authoritative volume - a large-scale empirical work comparable to Pitirim Sorokin's Social Mobility - is a penetrating and comprehensive study of social stratification and mobility in traditional Chinese society and a highly significant addition to the theoretical and factual foundations of contemporary social science. 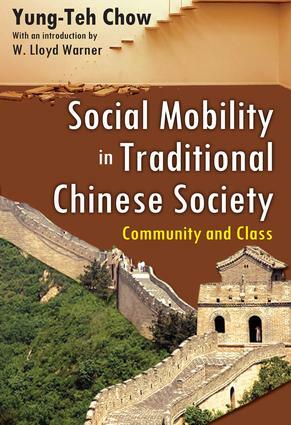 It offers an authentic portrayal not only of social mobility but of social life in China in general at the time of its original publication in the 1960s.It includes the life histories of the upper class - scholars, active and retired officials, merchants, and wealthy landlords - and an analysis of social statistics drawn from one Chinese county, which provides new interpretations of the processes of social mobility, the relationship of this class to society as a whole, and the motives of upwardly mobile individuals. Each life history comprises at least five generations and its resulting accounts touch upon the lives of 1,200 persons, and help place the development of the gentry in illuminating context within the population as a whole.Chow's book offers a welcome method of comparison of two societies that have both birth and mobile elites. As China entered the world system, its open class system changed from fluidity to disorganization regarding its character. As such it was transformed into an innovating society in which the earlier system could not, or did not, work. Social Mobility in Traditional Chinese Society is unique in its field for the successful correlation of conceptual framework with its detailed wealth of empirical findings. It will be welcomed by all students of social science, international relations, and Asian studies.